Bill Bradley is arguably one of the most well-versed public figures of our time. The eighteen-year New Jersey Senator, financial and investment adviser, Olympic and NBA athlete, national radio host, and bestselling author has lived in the United States as both political insider and outsider, national sports celebrity and behind-the-scenes confidante, leader and teammate. His varied experiences help to inform his unique and much-sought-after point of view on Washington and the country at large. As this moving call to arms reminds us, we can all-elected officials, private citizens, presidents-do a better job of moving our country forward. Bradley is perhaps the best guide imaginable, with his firsthand knowledge of governments' inner-workings, the country's diversity, and the untapped potential of the American people. Bradley is the author of six books on American politics, culture, and economy, including Time Present, Time Past, The New American Story, and Values of the Game-all New York Times bestsellers. 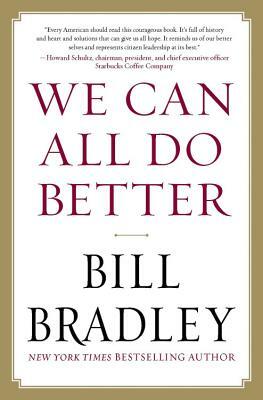 "Bill Bradley presents a cogent and historically grounded book, outlining the problems embedded in our current American way of civic engagement and proposing solutions." "An important contribution to the national discussion with appeal to independents as well as the more traditionally party-minded." "We Can All Do Better is a book that every responsible citizen should read, reflect on, and consider in determining which candidate to back in the upcoming elections." "Bill Bradley has bravely and frankly examined the most important issues America must deal with for its economic future, its foreign policy and its political system. He is trenchant in his criticism of what was allowed to happen to the economy leading to a near financial and economic catastrophe. . .He is particularly incensed with the gridlock in the political system, that Congress is more interested in scoring partisan points rather than moved by what is for the common good. Bradley has a good grasp of the huge challenge China poses for America. . .and what it takes for America to compete with China."